The Yangjaecheon stream is one of the tributaries of the Hangang River. 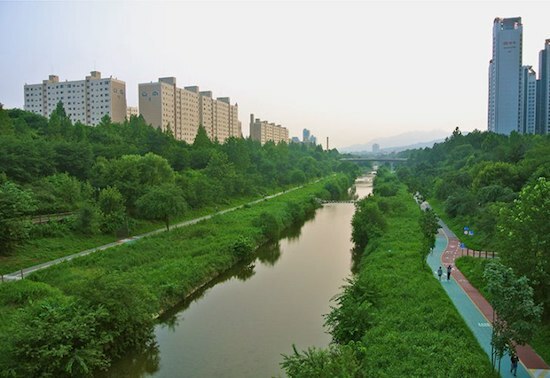 A bike path runs from Gwacheon to Gangnam, which is great for running as well. It’s about 7 km one way between the Seoul Racehorse Park in the south, to Gangnam, near the Hangnyeoul Station. Much of the trail along the stream has a pleasant canopy and is below the road. There are paths along both sides of the water, in sections, and also separated bike and pedestrian paths, in sections. The road between Dogok-dong to Daechi is lined with around 830 stately metasequoia trees. It’s also pleasant at night, as the trees are backlit by the streetlights provide a wonderfully romantic atmosphere.